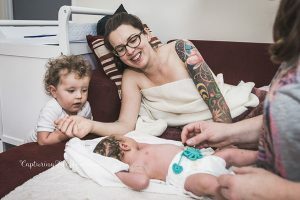 Looking back, I now realise that both my birth stories began before the births, each time I felt a huge sense of needing to have a child, the way I explained it to my Husband – Ben was as if there was a small voice outside of me wanting to be here and join us in our lives, nudging us to begin our family. 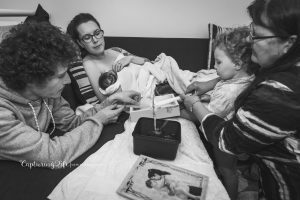 It was surreal and intense and eventually something I wasn’t able to ignore, we started our journey as parents after welcoming our first child – Juniper into the world with a planned homebirth which ended up in hospital after meconium being present in my waters at 37 hours, only to birth her completely naturally and without any intervention in hospital at 40 hours! It was long and took me to emotional and physical depths I never knew I was capable of reaching; it was not only her birth but also mine as a Mother. As soon as I began feeling that familiar desire to accept another child into our lives again I found I needed to accept and let go of a lot of things even months before we were able to conceive and as soon as I let go and trusted, and I mean truly trusted this baby, I must have been pregnant within days! From that point I knew I had to work on continuing to trust and be humbled in the strength of two souls working together to get the home birthing experience we wanted. 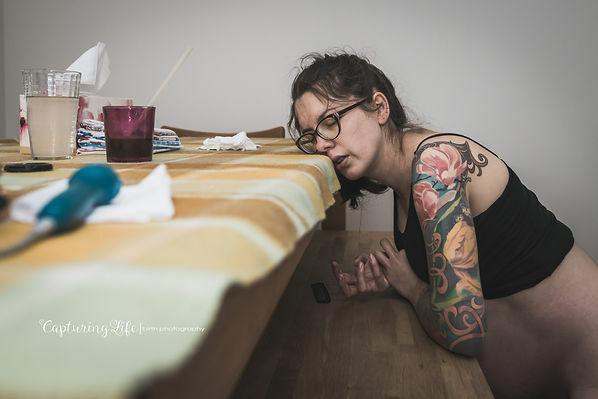 Soon after it was confirmed that I was in fact carrying our next child I called my midwife that I had with my previous birth, but she was now working alongside someone that I didn’t know. Honestly I was nervous to allow this person into my birthing space that hadn’t experienced how I birthed before but eventually I remember that trusting in the baby was what brought this baby to us and so again I chose to let the baby only allow who they wanted present at their arrival earth side. It took a lot of pressure off me recognising the power that a small soul in your body can have on the birth outcome by just trusting in them. I let this pregnancy come with as much ease as I could and tried not to over plan as much, apart from being certain that I would have this baby at home with my family and trusting that they would come to me with ease. It was October the 7th and I had spent the last 24 hours feeling really nauseous, I put it down to overdoing it with spirulina the last few days, I mean I was a week away from my “due” date so I didn’t think things were going to happen and if they did, I thought I would have time to get things in order. I decided that in the evening I wouldn’t do the housework and went to bed with Ben and Juniper in our shared bed. At 11.40am I woke to the soothing sound of heavy rain on the roof, thankful for our warm cosy bed. I then noticed Juniper being strange and getting herself into funny positions – I realise now she was feeling the shift of things around her that I was still blissfully unaware of. I tried waking Ben to sort her out but he was in too much of a deep sleep, I decided to try and go back to sleep myself and ignore it but then I noticed I was starting to feel tightening’s in my tummy, I decided I definitely needed to get some rest, my first thought was – this could be days away! 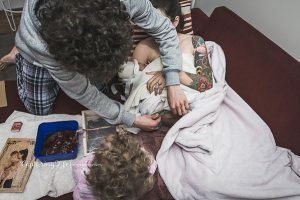 But then of course all the emotions started flooding in and I got a little teary for the thought of my last sleep with just the three of us and all those unpredictable changes that were on the way. 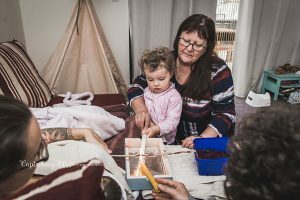 At around 1am I decided I really needed to wake Ben for emotional support, he was totally oblivious that things had started for me – I had always planned on not verbalising it until it was obvious, that just felt like the right way to do it this time. He thought I was just crying and hormonal and didn’t think much of it, until he was hugging me and felt my stomach tightening himself and asked if things had begun, I just quietly nodded. It was about now that I felt the next tightening all in my back, I remembered how baby had spent most of the third trimester in a posterior position but I had chosen to believe baby knew how to be birthed and not to worry. I quickly had a little talk to baby and explained exactly the best way to be positioned, I told baby to trust me, we were going to do this together, I never felt another tightening in my back after this! Not long after Ben agreed that we need to try and sleep but it wasn’t long until I felt I really needed to empty my bladder, as soon as I stood things began to intensify. I was standing in the doorway to our bedroom, holding the door frame and starting to make deep moaning noises, both Ben and I thought gee’s that is way too early to be making those noises but I needed to make them so I continued, at that point I was very thankful for the heavy rain masking my noise and not waking Juniper. I checked myself in the mirror and realised I was as white as a ghost and shaking. I asked Ben to get up with me and try to lie on the couch while I rest. It was 3am by this point and we thought we were nowhere near the finish line, I couldn’t understand why my body wanted me to get up and not be lying down. Eventually I said I need to get this baby down, Ben agreed, he helped me up and gave me a banana as well as some pre-birth arnica and some home-made labour aid to boost my energy. It was a relief to stand but it also made things intensify again, at this point I was needing Ben to press on the acupressure points on my lower back and the pain relief was instant! I had also tried the bath but I couldn’t handle the lower pressure and was making the tightening’s very close together! I still had no thought that this baby was going to arrive any time soon, I was thinking it was going to be another day or two away! At about 6am I felt I needed to change up my positions so was using the couch, hanging off Ben and using a comb in my hand for acupressure points but I was starting to feel like I wasn’t going to cope and I told Ben I thought we needed to call people but Ben held me and reassured me that I had asked not to introduce people until we really needed them here, I told him that I really needed them but he disagreed and told me how well I was doing, all I could think about was how much longer I must have! It was about 6:30am when we heard Juniper wake in the bedroom, she was upset, Ben brought her to me, she had fallen out of bed and needed comfort, I tried to nurse her between contractions but she wasn’t sure about the deep primal noises I was making by this point and bless her soul she tried to help by bringing me things that would make me feel better but I just couldn’t engage with her which was even more upsetting for her. She started to cry and tell me that she felt scared, I consoled her the best I could while Ben called my Mum to be with her, in the meantime we had to let her watch a programme on the iPad which she was very happy with and I could focus on birthing again. At this point I managed to convince Ben we needed to call the midwife in and at 7am she quietly arrived, we talked about giving me an internal which she knew I didn’t originally want but was asking for one at this point, she managed to convince me against it and reassured me that I was going to birth this baby this morning! I remember thinking to myself “yeah right lady! Just you wait, I’ll be days yet!” I heard Ben write something to her behind my back and then I heard the midwife agree then talk on the phone to my birth photographer – Cassie from Capturing Life Photography, she was telling her things are going faster than we had thought and that we needed her there! I still thought everyone was overreacting – I thought how can this baby just about be here! I haven’t even felt like I’m getting crushed with these contractions yet like I had experienced so vividly with my first! Completely forgetting all the birth preparation, I had done and asking this birth and the lessons that come with it to come to me with ease! I had forgotten to trust this baby! At this moment I decided to reach down and check how far along I was, I got a great shock when I felt the bag of waters with the head just behind it a few centimetres from the opening! I had reached full dilation without realising it and my body and the baby had already begun pushing without my mind catching up! I excitedly told my midwife and again she just smiled and said “Yes, your birthing this baby this morning” Just after this my Mum walked in and a sense of relief for me knowing Juniper had her support person there. A couple more tightening and pop! my waters broke! They were dark! I felt my heart drop, thinking we would be transferred but no one said anything apart from my midwife who must have seen my face and told me that no one was panicking and it was ok! I was surprised but it was exactly what I needed to hear. I gathered my thoughts and told myself to get up and birth this baby now! I got on all fours and rested my arms on the table in front of me and went into a deep squat with my knees on the ground and Ben behind me ready to catch. It was at this point that everyone around me dissolved into the background, it was just me and my baby working together. 8:30am And the birth photographer made it! I had everyone here now! All I had to do was bring this baby earth side! I felt a lot less pressure now my waters had gone and the head was ready to pass through soon after, I really had to use my control to let this happen slowly so I didn’t tear! Unlike my first birth I really felt the ring of fire and if I was able to I would have been screaming “THE RING OF FIRE!!! !” as baby’s head was crowning! 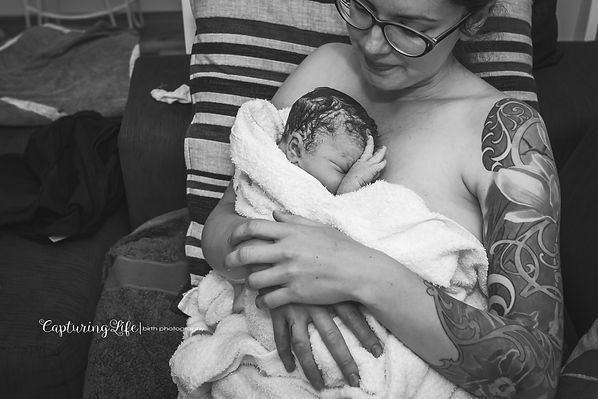 I could feel baby doing a lot of the work and really getting themselves out of the birth canal, I was praising baby in my head for doing so well! I had no fear, just complete trust in the process, in my body and my baby. At 8:42am on the 8th of October our baby boy Azure Bloom was born into his Daddy’s arms with big Sister watching from a distance, we asked her to come closer and she gave Daddy cuddles and me a kiss. It was the most powerful feeling realising I had just done it! 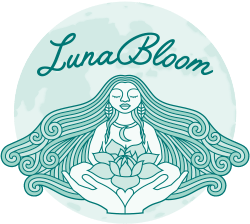 I had gotten my home birth! 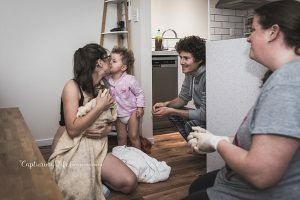 And as much as I wanted to stay where I was I needed to move from the kitchen floor so Ben and my midwife helped me onto the couch so that I could birth the placenta, which I did while giving Azure his first breastfeed. 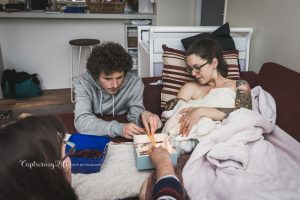 We had a candle burning ceremony prepared for us by Marti from Luna Bloom to have a slower and peaceful transition for the separation of the umbilical cord. We did this after about an hour or two when the cord had truly stopped pulsating, it smelt a little bit like barbeque but nowhere near as much as I had anticipated and only took about 5 minutes to burn through, it was a lovely experience that the whole family could partake in. After we had finished this my midwife rinsed my placenta and prepared it into small pieces to keep in the freezer to have a placenta smoothie every day to help heal me postpartum and aid in my milk coming in as well as keeping my hormones level. My love hormones were kicking in at this point and I felt like superwoman! I cleaned up in my own shower with my own things which was bliss while Ben got his first skin to skin cuddles, when I got back I could see Juniper needed to know her Mummy was ok so I invited her to sit on my lap and nursed her, soon after Azure needed feeding too, so we jumped straight into our first tandem feeding experience, it just doubled my superwoman feelings! I was in awe of what my body just did and was still doing to provide for my children! Woman’s bodies are amazing! Having found the ability to trust in the process and power of my body I learnt that what we are left feeling from our birth experience is life altering, not only for the Mother but for the child as well. I could not have asked for a more perfect birthing experience for us that I feel extremely blessed for experiencing, down to who was present and when they arrived to the rain and the time of day. It was 5 hours of actively truly letting go and trusting in the Divine as we welcomed our peaceful little boy to complete our family of four.